Baseball is a game meant to be played in series. All season long, teams a locked into (mostly) three-game series with division, league and interleague foes. But none are bigger than this. The World Series has been shortened to a best-of-3, thanks to the bat of Jonny Gomes. Gomes’ three-run homer lifted Boston to a 4-2 win and evened its series with St. Louis at 2-2. Now, the final series of the marathon season becomes a sprint: Who can win two of the next three? We’ll have half the answer tonight when Boston faces St. Louis for the final game at Busch Stadium. The Red Sox and Cardinals have split each of the games at each stadium and the winner tonight will come within one game of being crowned champion. On the hill for the Sox is ace Jon Lester, who won Game 1 with perhaps his best performance to date. Lester went 7 2/3 innings without giving up a run, striking out eight, walking one and allowing just five hits. His command was pin-point and his stuff was the best it’s been all season. The Sox certainly would like him to duplicate that tonight. Another ace will be opposite Lester when Adam Wainwright starts for the Cardinals. Wainwright had a rough go in Game 1, losing to the Sox and getting off to a bad start from the time he left the dugout. Wainwright knocked his head on the cramped Fenway Park visitors dugout before heading to the mound and it was all downhill from there. He lasted just five innings and gave up five runs (three earned) as Boston blew away St. Louis 8-1. With the lineup producing a win Sunday, John Farrell has opted to stick with the same crew for tonight. However, there is a slight change to the order, as Dustin Pedroia has moved into the two-hole with David Ortiz batting third and Gomes clean-up. Ortiz is 8-for-11 (.727) this World Series and it gives Boston a chance to get his bat in the game in the first inning, should Pedroia or Jacoby Ellsbury not reach base. David Ross has virtually been Lester’s personal catcher, so he’s back behind the plate for the third time in five games this series. It doesn’t seem either team has been able to seize any kind of momentum this series. The Sox won Game 1 8-1 and everyone thought they’d be on cruise control the rest of the series. 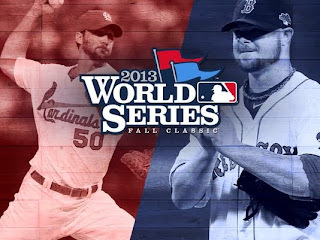 However, the Cards fought back to win Game 2, despite Boston grasping a late lead. St. Louis had two-run leads twice in Game 3, only to win it on a walk-off obstruction call. They couldn’t carry that over to Game 4, where Boston won 4-2 on Gomes’ blast. Both teams are typical scrappy ball clubs and no lead is safe. The Sox, however, would do a world of hurt by winning tonight – their second in a row – and heading home for a chance to win it all over the next two games. Of course is the Cards win, St. Louis would have two chances to close it out, but both would have to be in front of a raucous Fenway crowd.